Text by . Edited by Tom Upshaw. Pictures by Alberta Callender, Austin Bovenizer and Tom Upshaw. 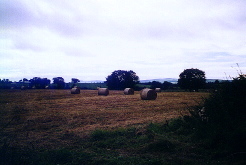 Rathkeale is situated just off the N21 highway, 25 kilometres (16 miles) south-west of the city of Limerick, Ireland. Rathkeale is the second largest town in County Limerick, its name derived from Rath Caola, or Caola's Fort. Its early history is reflected in the remains of an Augustinian Abbey, built in 1289, and the restored Castle Matrix, dating from 1410. The town was already well established when the refugees from the Palatinate arrived in 1709. The town's population has three distinct origins: Irish, Palatine and Traveller. There is a significant population of travellers who use their homes here for some periods of the year. 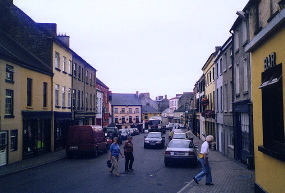 Until recently, the town was probably most widely known for its traffic jams, as the main flow between Limerick and Tralee became temporarily becalmed along its narrow main street. The Rathkeale bypass, constructed in the early 1990's, brought relief to all. The main street has changed little in 100 years, and our forefathers would probably still recognise it. The major change in Rathkeale's main street is the hotel. Following a memorable stay at the old Rathkeale House Hotel in 1991, we were delighted when we heard it had been demolished ! We are sure you will be pleased with the comfort of its successor. The hotel phone number is + 353 69 63333. You may stroll roughly a mile along the town's main street. To the west of town are the other original "parent colonies", Killeheen and Courtmatrix. 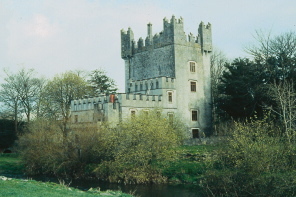 Castle Matrix. This was the home of Sir Thomas Southwell, who took the Teskeys and 100 other refugee families onto his land in 1709. Castle Matrix fell into ruins, like hundreds of Irish castles, but was beautifully restored by an American who has since died. As a family home, it is opened to visitors. 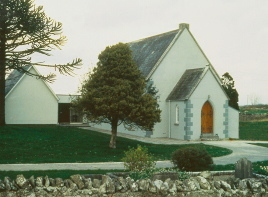 Ballingrane (pronounced with the "e" silent and emphasis on the "gran"). This settlement just outside Rathkeale was one of the three "parent colonies" established by the Palatines. Here, the Methodist Church was built in 1766 and dedicated to the memory of Philip Embury and his cousin Barbara Heck. These Irish Palatines left Ballingrane around that time and were instrumental in the founding of the Methodist Church in America. The neat cemetery is the final resting place for many Palatines. 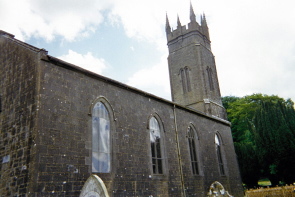 The Church of Ireland, Holy Trinity Church, was built at the West end of Rathkeale in 1831 and is on a site that has been a place of worship for over 700 years. The uneven cemetery is the final resting place for many Palatines. Some of the weather-worn memorial stones are difficult to read, but a copy of the inscriptions was published in "The Irish Ancestor" in 1982. A very short walk downhill will take us to the Rathkeale Number 2 School that many of our ancestors attended. It was built next to, and at about the same time as, the church. 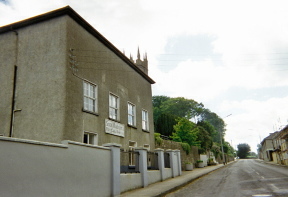 Killeheen Lane. In the early 18th century, 27 Palatine families lived and farmed along this lane, and their cattle grazed on common land. The smallholdings have gradually combined into more economic units, but some of the early buildings survive. We may meet John 1946 Teskey, Rae's husband. He is the 8th or 9th generation of the Teskey family to farm here. Adare. 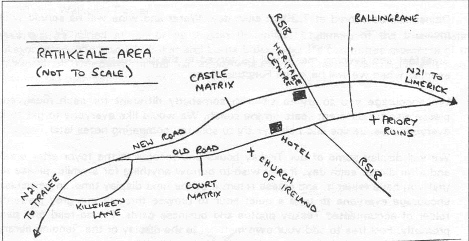 When the Palatines started to spread out from Rathkeale, several families migrated to Adare, including some Teskeys. At the Adare Heritage Centre, you can get a snack, and there are a number of other establishments that offer lunch. Should you need a cash dispenser, this is the place - turn right outside the Heritage Centre and it's about 100 metres. 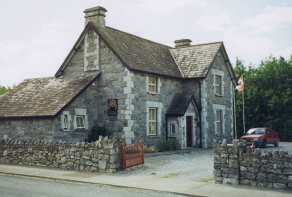 (Alberta Callender-) This is a photograph of the Irish Palatine Association Museum and Heritage Centre at Rathkeale, Co. Limerick. When a new Ring Road was constructed using the old Railway lines, this lovely Cutstone building which had been the Railway Offices was presented to the Irish Palatine Association, dismantled, and each stone numbered. It was carefully reconstructed within a large Car Park. It houses a small exhibition of artifacts, collected and presented by members, from Palatine homes; the library, archives and a small coffee shop. This latter is overlooked by the large railway shed which the I.P.A hopes some day will house the larger collection of artifacts and photographs, now in store, which at present they are unable to exhibit in the Museum - if ever finance becomes available.